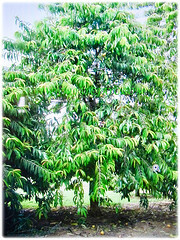 Malabar Tamarind is an ornamental, tropical and fruit-bearing tree. It has popularly used as a common ingredient in Asian dishes such as curries and soups. Botanical Name: Garcinia atroviridis (syn. 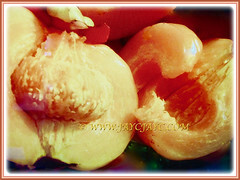 : Garcinia cambogia). Common Names: Malabar Tamarind, Asam Gelugur/Keping in Malay. Etymology: The genus name Garcinia is named in honour of Laurent Garcin (1683-1751), a French botanist who travelled widely in India. The specific epithet atroviridis in Latin means very dark green, referring to the colour of its leaves. Origin: Native to Peninsular Malaysia, Singapore, Thailand, Myanmar and India. It is also cultivated elsewhere around the world. 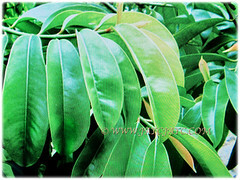 Features: Garcinia atroviridis is from the genus Garcinia that consists of 395 species of plants. 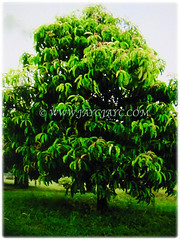 The dioecious tree grows to a height of between 16- 25 m.
It has a long trunk, smooth grey bark and drooping branches. The leaves have leathery leaf blades that are oblong and glossy dark green above with fine dark wavy lines on the underside. 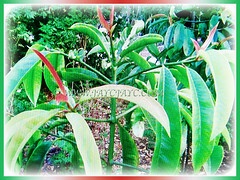 The 12.5-30 cm long and 3-7.5 cm wide leaves have a pointed tip and upturned edges. They are oppositely-arranged and held on a 1.5-3 cm long petiole. Young leaves are pinkish in colour. 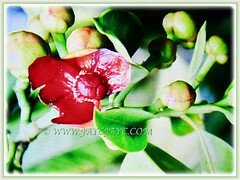 Its large 3-4.5 cm wide flowers are dark red with crimson petals and are faintly fragrant. Flowers are pollinated by insects and fruits are eaten by small mammals. 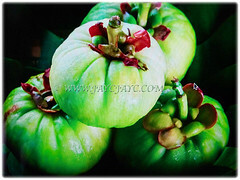 Its large fruits are nearly round and borne singly on twig ends about 7-10 cm in diameter. 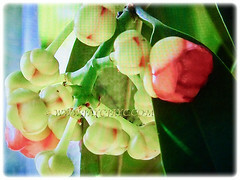 They are coloured bright orange-yellow when ripe and contain numerous flattened seeds. 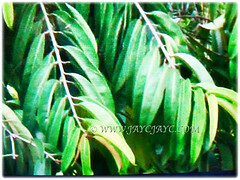 Culture (Care): Garcinia atroviridis or Malabar Tamarind can be grown easily with least maintenance. Others: For Pineapple trees to thrive well and increase the size of fruits, feed them once every fortnightly with a balanced fruit fertiliser that’s high in nitrogen, potassium and iron. Generally free from serious pests and diseases. However, watch out for scale, thrips, mealybugs, nematodes, wilt rot, root rot, sap beetle, palmetto beetle, pineapple mite and pineapple red scale. 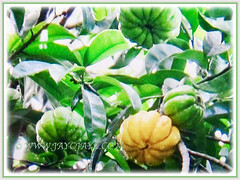 Garcinia atroviridis or Asam Gelugor is a tropical or near tropical plant that produces edible fruits. A temperature range of 18.33-45°C is most favourable, though the plant can tolerate cool nights for short periods. Prolonged cold retards growth, delays maturity and causes the fruit to be more acidic. Propagation:Easily propagated from seeds. Alternatively, it can be propagated by grafting to ensure female plants. Usage: Garcinia atroviridis or Malabar Tamarind with its ornamental flowers and edible fruits are excellent for gardens, parks and roadsides. Its fresh fruits or dried fruit slices are used as a seasoning. The young leaves can be eaten too. The ripe fruits are sliced, dried and used in curries or stewed in plenty of sugar to be eaten. Sun-dried slices of the fruits, locally known as Asam Keping is extremely sour and used as a common ingredient in Asian dishes such as curries and soups. Besides, it has some medicinal uses. Juice from the leaves is used by a woman after childbirth. A decoction of the leaves and roots is used for ear-aches. The dried fruit is used for improving blood circulation, as an expectorant, treatment of coughs and as a laxative. The fruit extract can promote good health by reducing blood-cholesterol levels and enlarging the blood vessels, fight depression and increase bowel movements. The fruit contains citric acid, tartaric acid, malic acid and ascorbic acid, hydroxycitric acid (HCA) and flavonoids. HCA is excellent in helping to reduce weight.